A series of capacity building grants has helped people experiencing homelessness find stability and employment. 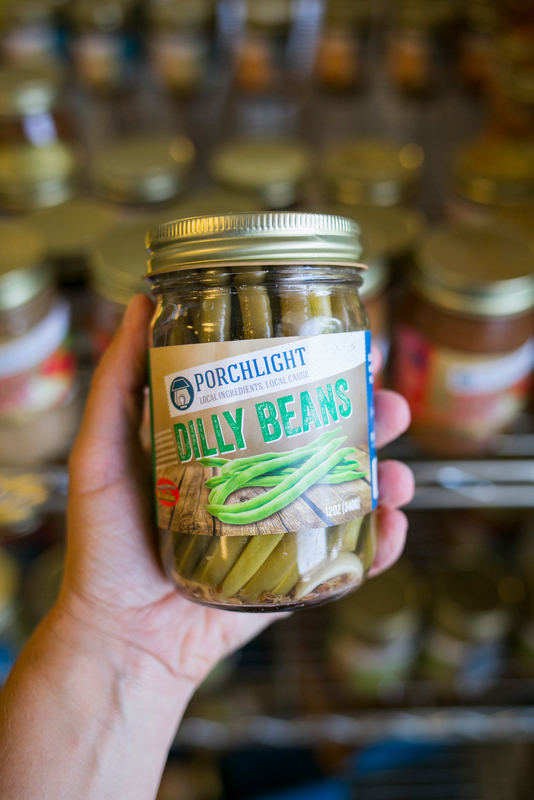 Dilly beans are among the many local foods available at Porchlight Products. The causes of homelessness are well documented— the top three are poverty, violence or threat of violence, and mental health. Porchlight, Madison’s largest nonprofit provider of housing and services, considers these barriers insurmountable for many people who encounter them and views long-term support as the solution. Madison Community Foundation’s partnership with Porchlight is long-term as well. Community Impact grants for capacity building projects date back to 1991, from renovating the drop-in shelter, to helping two agencies merge to become Porchlight, to launching the DIGS program to prevent eviction. Porchlight Products is among the many successful programs MCF has helped pilot. 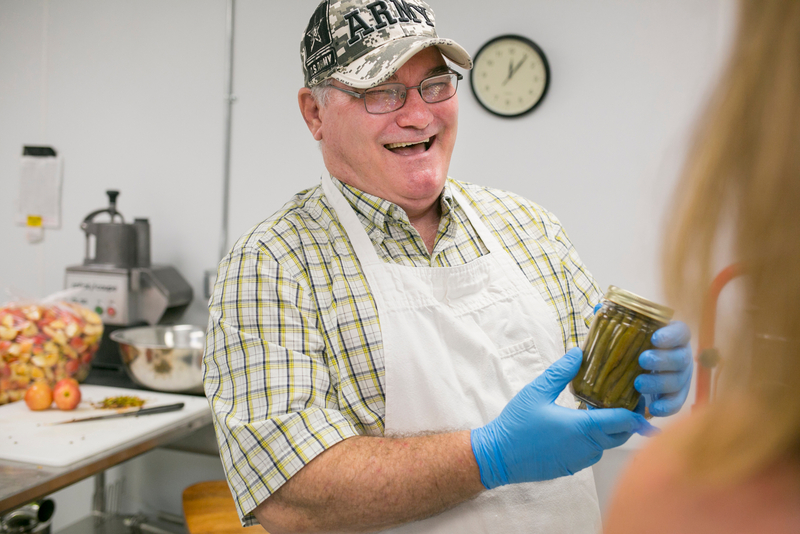 In 2005, with a grant from the Community Impact Fund, Porchlight piloted an innovative idea to create jobs for people with disabilities, use locally grown food, and provide an additional revenue stream. 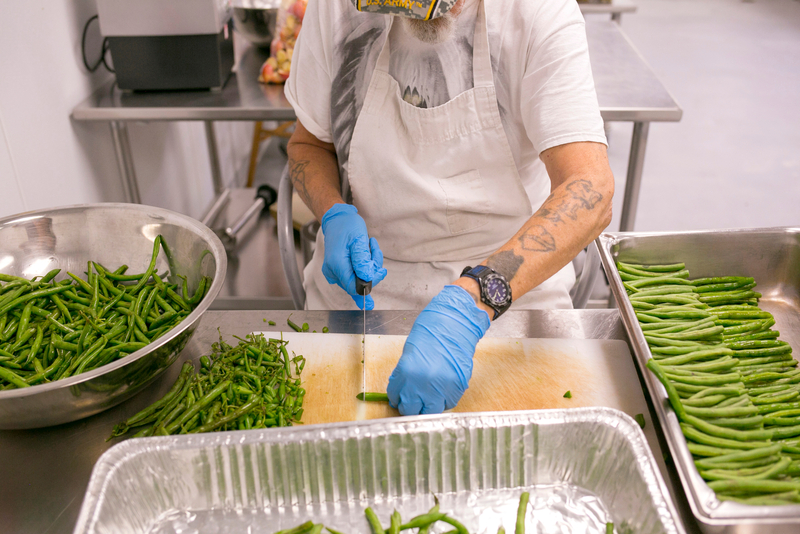 In 2007, MCF funded the launch of the program, which hired six people with disabilities who were formerly homeless and established relationships with three local farms and eight restaurants. In 2014, Porchlight embarked on a $4.5 million capital campaign to build an east-side campus with 28 housing units, a commercial-grade kitchen for Porchlight Products, a separate kitchen for Madison Area Urban Ministry’s Just Bakery employment training for returning prisoners, and a maintenance service center for all of its properties. 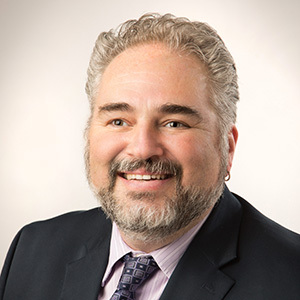 Porchlight resident Wil Ayote is a graduate of the Veteran Transitional Housing program and one of the original Porchlight Product employees. “The gift from the Community Impact Fund was at the beginning of that capital campaign, so it gave the campaign momentum and credibility,” said executive director Karla Thennes. In 2017, the new location opened with the help of an additional grant from MCF to furnish the apartments and purchase kitchen equipment. Also last year, Porchlight Products employed 25 individuals in its training program. Today, Porchlight Products is a thriving vocational rehabilitation program. Jams, pickled items, and dry baking mixes—12 products in all—are in 16 different retail locations and on the menu at 12 local restaurants. Other programs MCF has supported are the launch of the Veteran’s Transitional Housing project, which renovated a building and houses up to 24 veterans who were formerly homeless, and a new facility for Safe Haven, a drop-in shelter and transitional residence that has served nearly 900 clients. After Safe Haven’s federal funding was cut last year, MCF funded a campaign to keep the facility open. Thanks to the foresight of donors who’ve left unrestricted gifts to MCF, the Community Impact Fund will continue to partner with Porchlight on innovative solutions to fight homelessness in Dane County.